Though the mornings are still cool, the first days of spring have been glorious. I have already done a spring clean of the wardrobe and filled bags for the op shop and more bags for a garage sale later this month. I'm also pondering new knits for the changing season, despite having the better part of a front panel and both sleeves to do on a winter cardigan. 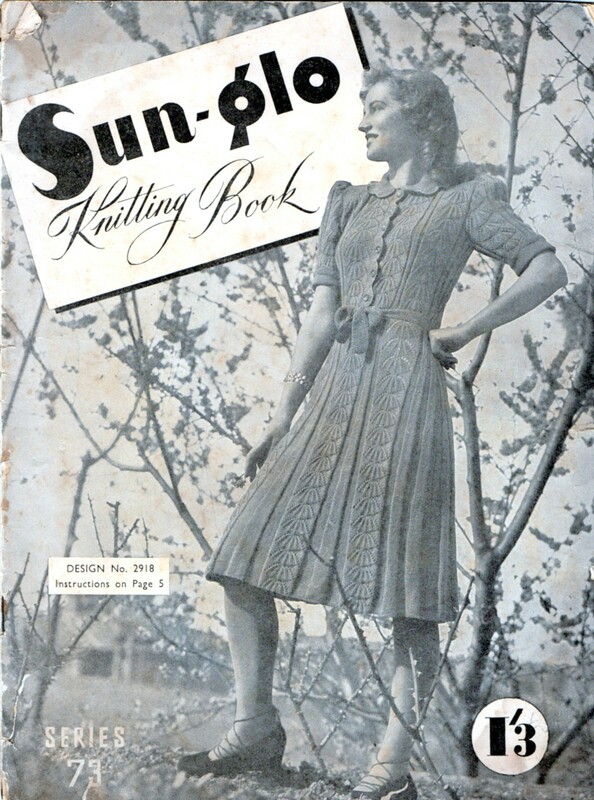 This Australian Sun-Glo Knitting book was an op shop buy, picked up for the World War II knits and information about the wartime wool supplies. Under the headline, Serving Australia ... Serving You, the Sydney-based wool manufacturer explained why retailers were low on yarn. "Most of the machines that in past years have made millions of skeins of Sun-Glo and Sunbeam Wools are working at full pressure to fulfil Australia's wartime needs. The bulk of our production is now requisitioned to the Defence Department. "We are of course, still manufacturing these wools for your requirements, too. But our margins of reserve stock must necessarily be smaller than in peace time. So if your retailer cannot immediately supply you with certain shades or quantities, please make allowances for our difficult war-time manufacturing problems, and remember the greater needs of our men overseas. "In serving Australia first, we are also serving you." Sun-Glo wool - advertised as shrink-proof to hold its shape - was produced in Sydney's Alexandria and if you look at the scenery in the modelled patterns, you will see Birchgrove, or Balmain, in the "Tween Seasons" pattern, and the Macquarie Street entrance to the Sydney Royal Botanical Gardens in another pattern, not shown here. These designs really are quite timeless aren't they Katie? 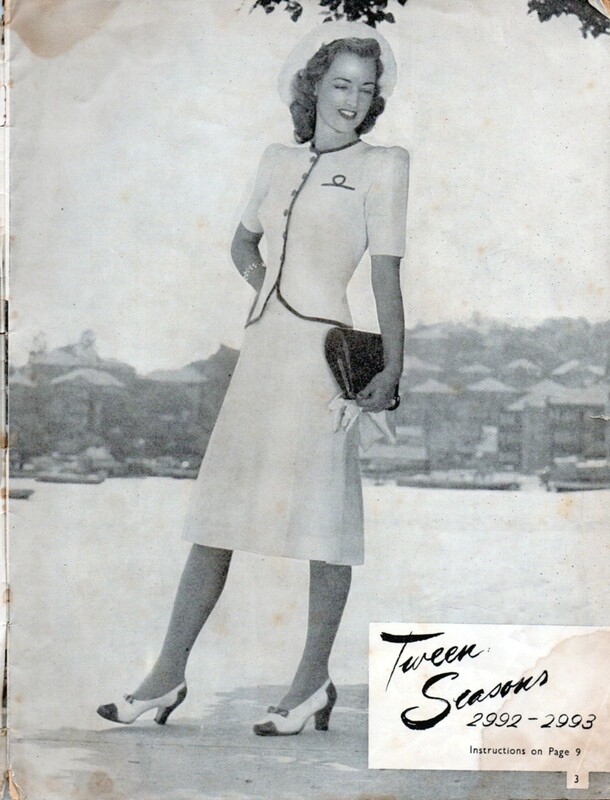 I especially like the Tween Seasons, I can imagine wearing something similar to the races, actually it would be perfect race wear. I have been loving your travel photos. 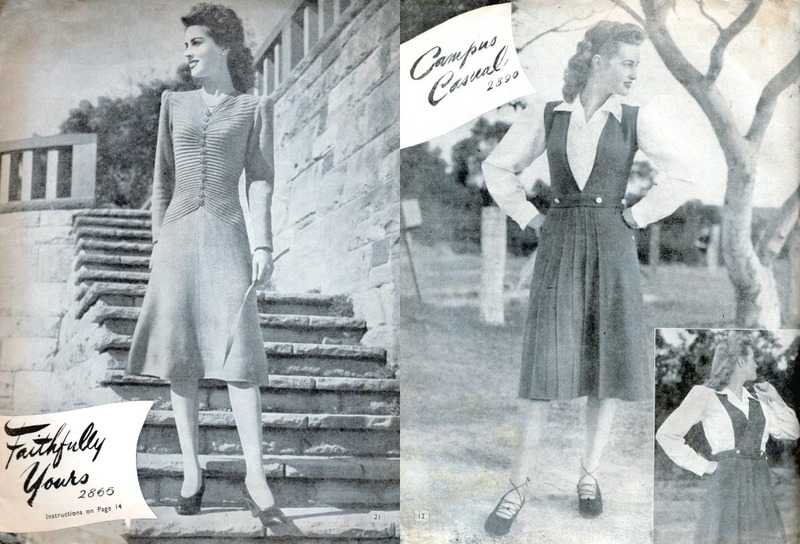 I quite like the 'Campus Casual' with the crossover front. Thanks for the nice words about the Malaysia travel pics. I've only posted a smattering of what I took to Instagram. So many more. I haven't yet pulled everything off the camera. Gah! The editing and culling I'll need to do.